DUMBARTON netted a late winner in extra time against Connah's Quay Nomads in round two of the Irn Bru Cup to prevent a penalty decider. A 400 crowd at the YOUR Radio FM103 Stadium saw a stuffy and competitive cup tie againsth the Welsh side, albeit not very exciting at times. The first half proved to be a largely scrappy and at times ill-tempered affair, with both teams struggling for dominance. On 26 minutes the referee spotted an infringement following a series of scraps in the Dumbarton area, and pointed straight to the penalty spot. Callum Morris duly stepped up to send Scott Gallacher the wrong way and give the hosts the lead. From then on Connah's Quay marked closely, packed tight at the back and used their physicality to defend their lead, whittling away time whenever they could. Sons pressed hard after the break, but struggled to get in behind the Nomads' back line. On 54 minutes John Danby was forced into a superb reaction save to deny a powerful overhead kick from Christian Nade. Then, with nine minutes left on the clock, Sons brought home fans to their feet by grabbing a well deserved equaliser. Dimitrios Froxylias, who had been Sons most creative player on his debut, whipped in a corner which David Wilson fired through the defence and into the net. 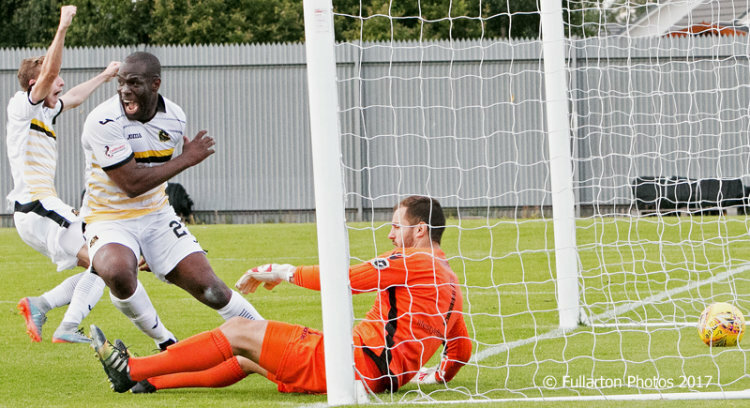 Dumbarton tried hard for a winner, but to no avail. So the tie went to 30 minutes of extra time, with the home side soon well on top again. On 118 minutes George Horan was dismissed for a second yellow card after persistent fouls against Christian Nade. From the resulting free kick on the edge of the box Froxylias flashed in a fine ball which the keeper got a hand on but could not keep out.